The death of Nelson Mandela reminds us of the great victory that the black masses of South Africa achieved over the vicious, cruel and regressive apartheid system first encouraged by British imperialism and then adopted by a reactionary and racist white South African ruling class to preserve the privileges of a tiny few. Mandela spent 27 years in prison and the people he represented fought a long and hard battle to overthrow a grotesque regime, backed by the major imperialist powers, including the US, for decades. Despite the efforts of the British Conservatives, particularly under Margaret Thatcher, the winer and diner-in-chief of all reactionaries globally, and the other imperialist leaders, the South African regime was eventually brought to its knees by the sacrifices of millions of black South Africans: the labour forces in the mines; the children in the schools and the people in the townships. They were backed by the solidarity actions of workers and people in the major countries through boycotts, strike action and political campaigning. It was a big defeat for the forces of reaction in Britain and America. But the timing of the end of apartheid was also due to a change of attitude by the white ruling class in South Africa and the ruling classes of the major capitalist states. There was a hard-headed decision to no longer consider Mandela ‘a terrorist’ and recognise that a black president was inevitable and even necessary. Why? South Africa’s capitalist economy was on its knees. That was not just because of boycotting, but because the productivity of the black labour in the mines and factories had dropped away. The quality of investment in industry and availability of investment from abroad had fallen sharply. This was expressed in the profitability of capital reaching a post-war low in the global recession of the early 1980s. And unlike other capitalist economies, South Africa could find no way of turning that around through the exploitation of the labour force. The ruling class had to change strategy. The white leadership under FW de Klerk reversed decades of previous policy and opted to release Mandela and go for black majority government that could restore labour discipline and revive profitability. For his deserts, De Klerk got the Nobel Peace Prize along with Mandela, who became president at the age of 76! 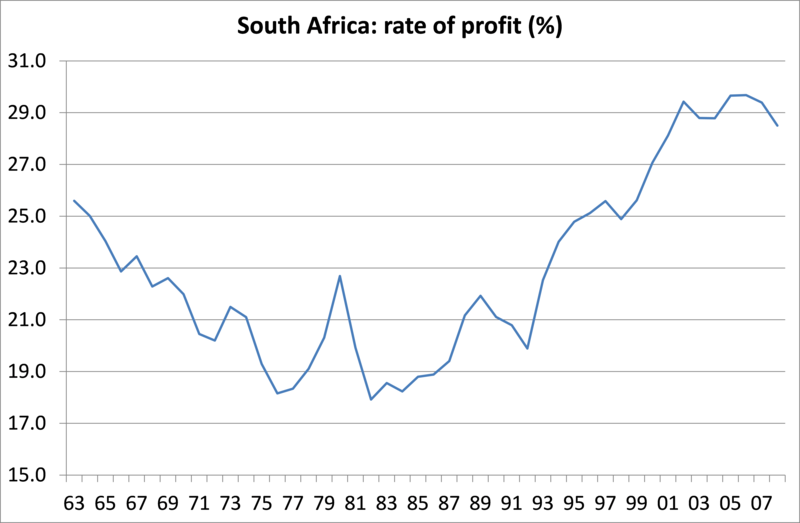 And profitability did indeed rise dramatically under the first Mandela administration as the rate of exploitation of the workforce rocketed. The rise in profitability tapered off in the early 2000s as the organic composition of capital rose sharply through increased mechanisation even though that yet a further rise in the rate of exploitation. South African industry is now in difficulty, unemployment and crime remain at global highs and economic growth is foundering. South Africa under Mandela and later Thabo Mbeki has seen some improvement in the truly awful living situation of the black majority, in sanitation, housing, electricity, education, health etc, ending the cruel and arbitrary control of movement and the inequality of the apartheid regime. But South Africa has the highest inequality of incomes and wealth in the world still and inequality has never been higher as black capitalists have joined the white ones in the economy. Despite its professed socialist ideology, the ANC never went towards replacing the capitalist mode of production with common ownership, not even of the mines or resource industries. And now the rich whites are joined by rich blacks who dominate businesses and exert overwhelming influence over the black leadership of the ruling ANC party. The ANC expresses the sharp divisions between the majority of working class blacks and the small black ruling class that has developed. These fissures erupt every so often as yet without a decisive break (as we recently saw with the shooting of striking miners by police under a black government). Mandela’s legacy was the end of apartheid; the struggle for equality and a better life continues with subsequent generations of his people. This entry was posted on December 6, 2013 at 7:34 pm and is filed under capitalism, economics, Profitability. You can follow any responses to this entry through the RSS 2.0 feed. You can leave a response, or trackback from your own site. “As far as the Communist Party is concerned, and if I understand its policy correctly, it stands for the establishment of a State based on the principles of Marxism. Although it is prepared to work for the Freedom Charter, as a short term solution to the problems created by white supremacy, it regards the Freedom Charter as the beginning, and not the end, of its programme. “The ANC, unlike the Communist Party, admitted Africans only as members. Its chief goal was, and is, for the African people to win unity and full political rights. The Communist Party’s main aim, on the other hand, was to remove the capitalists and to replace them with a working-class government. The Communist Party sought to emphasise class distinctions whilst the ANC seeks to harmonise them. This is, My Lord, a vital distinction. De Klerk was brought to his knees by the Fall of Soviet Communism in 1989 at the end of the 75 Years War (1914-1989). With the realigning of World Politics which is still ongoing, The White Majority Republic of South Africa was no longer needed as a bulwark against Soviet Imperialism in Southern Africa. The U.S. and U.K. were able to respond to criticism about their constructive engagement policies by forcing De Klerk to release Mandela from prison. No longer funded by Moscow, the ANC realized a long armed struggle was no longer possible. Mandela and De Klerk worked out the compromise we now see now. How long peace remains now that Mandela is dead remains to be seen. South Africa today ranks as the most socially unequal country on the face of the planet. The gap between wealth and poverty and the number of poor South Africans are both greater than they were when Mandela walked out of prison in 1990. Michael Roberts, above, provides a statistical explanation to this. Fully 60 percent of the country’s income goes to the top 10 percent, while the bottom 50 percent lives below the poverty line, collectively receiving less than 8 percent of total earnings. At least 20 million are jobless, including over half of the younger workers. Meanwhile, under the mantle of programs like “Black Economic Empowerment” (BEE) a thin layer of black ex-ANC leaders, trade union officials and small businessmen has become very rich from incorporation onto boards of directors, acquisitions of stock, and contracts with the government. It is under these conditions that ANC governments that have followed Mandela’s, first under Thabo Mbeki and now Jacob Zuma, have come to be seen as the corrupt representatives of a wealthy ruling establishment. Yes, the Patrick Bond article the best I have seen. Unfortunately for your claim, the ANC never ever had a professed socialist ideology. And the alliance it had with the SA Communist Party meant that any socialist ideology it brushed with had a clearly counter-revolutionary and Stalinist content – ie it wasn’t socialist at all in any serious Marxist revolutionary sense. It’s important for us to be clear over this in these days of crocodile tears and the paroxysms of Peace and Non-Violence being sprayed over us by the pro-imperialist, pro-capitalist Big Liars. Otherwise I agree with your position that capitalism in S Africa had reached an impasse – slavery is a crap technique for running a capitalist economy and causes all sorts of problems in a bourgeois democratic society. Myself I’m disinclined to agree that the end of apartheid is Mandela’s legacy, just as little as Independence in India is the legacy of another piece of Sublime Hypocrisy, Mahatma Gandhi. Roughly the same goes for Gandhi’s greatest disciple and Congress apostle. The more we discover about him and his policies, the less admirable will he seem. So rather than join the chorus of hypocrites and paid wailers at this wake, I think I’ll walk by the coffin with my class-independent revolutionary Marxist head held high and spit in the traitor’s face. Choppa- your comment is a disgrace and ignorant. You should hang your head in shame. Had your ultra leftism had any influence we would have seen a blood bath in South Africa and that no doubt is your secret wish. I don’t discount the possibility of course that you are part of some rightest provocation to besmirch the liberation movement. “Liberation”??? movement, P Spence? Liberation from what exactly and why? Your comment is so vague and sweeping (and ideologically apologetic) that there is hardly anything to hang a response on. Get real and stop worshipping the Peace and Non-Violence of the graveyard. Perhaps you don’t think Marikana counts as a bloodbath? Factual interlude: Mandela was no disciple of Gandhi. As for the rest of it: Look at South Africa now– you don’t get to say– “Mandela ended apartheid” without acknowledging that the way apartheid ended has created the current, and miserable, situation. I don’t doubt that P Spence couldn’t tell “rightist” from “leftist” is his life depended on it. His probably doesn’t. But all those who thought the ANC would bring emancipation– their lives do. Nonsense. You cannot separate form and content like this. 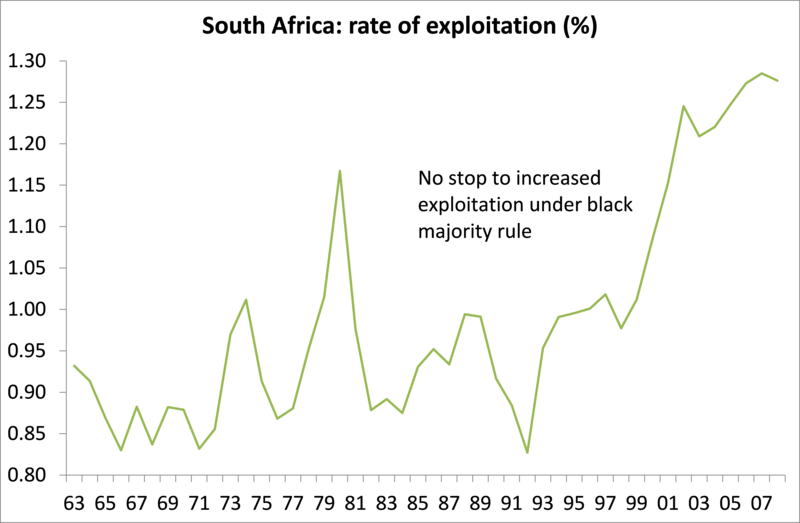 The way apartheid was ended inevitably led to this growth of inequality. Mandela’s legacy was political and economic ; Ramaposa and Zuma and the Marikana Massacre are his children. Re: Michael R. “ANC never went towards replacing the capitalist mode of production with common ownership”. Confusion comes from colonial institutional misperceptions of socialism/capitalism as ‘opposites’, through which we are trying to understand Mandela’s cultural legacy. ‘Indigenous’ (Latin ‘self-generating’) ‘economy’ (Greek ‘oikos’ = ‘home’) to which African peoples are an integral part, integrate of ‘social’ (L ‘friendship association’) & capital (L. ‘cap’ = ‘head’ or ‘wisdom’), left & right wings as ‘complementary’ parts of a whole. It takes both wings to fly. Indigenous economy carries the details about how to achieve integrity step-by-step in mutual-aid, https://sites.google.com/site/indigenecommunity/home/2-mutual-aid. Marx & Engels’ ‘Origin of the Family, Private Property & the State’ is sourced from the work of Lewis H. Morgan, anthropologist. Morgan describes ‘Haudenosaunee’ Iroquois ‘People of the extended home or welcome’ confederacy) & other nations. M & E aspire to capture some of Morgan’s translation of indigenous knowledge in communism but never completely understand indigenous economic integrity. ‘Das Kapital’ is a major anthropological contribution on the origin of capital (economy governing knowledge) in labour, generally misunderstood in European colonial nations.